Essenza reed diffusers are now being replaced by ESSENZA ultrasonic fragrance diffusers – designed to fragrance your home in a natural, sweet way, without being too over-powering. The newest addition to the range is a diffuser with a changing LED light. 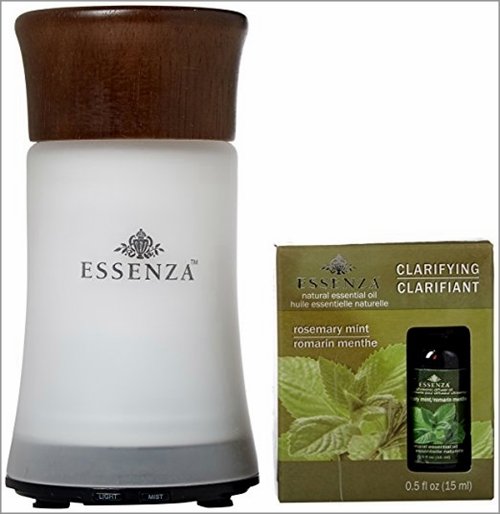 This produces a very fine mist of aromatherapy essential oil in your chosen fragrance. I love the look of this product, it is very stylish with a combination of wood and frosted glass. There are fourteen different colours and the option to choose between constant on or a rotating light pattern. This makes it suitable for ‘mood lighting‘ as well as providing a mood-enhancing aromatherapy fragrance. You can choose a continuous stream of the fragrance mist or the intermittent option. There is no heat with the LED technology used, so the oil will not degrade. The unit is simplicity itself to operate. All you need to do is to fill the internal water reservoir to the level indicated, add three to five drops of your chosen oil and then replace the plastic cover. The final thing to do is to replace the outer glass sleeve and turn the unit on. Use the buttons to choose which lighting and fragrance dispensing options you want. The unit comes with all you need to get started, including power supply, a measuring cup and 15 ml of the oil. It operates quietly and unobtrusively and there is an automatic shut-off feature when the water reservoir gets low. 1. Use cooled boiled water or purified water if you live in a ‘hard’ water area to reduce any risk of mineral build-up within the unit. 2. You do not have to use the same fragrance each time. Buying individual fragrance oils makes this a very versatile way to scent your home with a fragrance to suit your mood (choose relaxing, calming, enervating – and so on) or to suit the season. With no need to replace diffuser reeds when you decide to change the fragrance, this also makes the Essenza Ultrasonic Diffuser an economical option. 3. You can use fragrance oils from another manufacturer in this unit. 4. 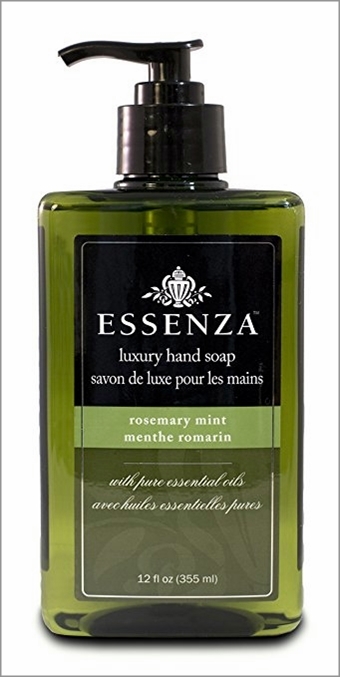 Coordinate the fragrance from your diffuser with one of the range of hand soaps from Essenza – for example, the diffuser, pictured above, comes with Rosemary Mint oil and pictured below, is the matching Rosemary Mint soap . There are several other options including Mango Agave and French Lavender. Many people have tried scented candles, fragranced plug ins and reed diffusers to create a sweeter smell around the home, before turning to Essenza ultrasonic diffusers to find exactly what they have been looking for. There are many reasons that these provide the ideal solution. For starters, there is no risk of smoke or fire, as there is with candles. If you have small children or pets, you might be wary about having open flames around the place, even if the scent is wonderful. Plug ins and gel fragrance kits are both easy, practical options, but many people complain that they can smell artificial, or that they don’t last as long as they should. The same issues occur with aerosol sprays, along with the concern that they are not an environmentally friendly choice. As well as using them to improve the ambiance in your own home, you should consider them as attractive gift for others. Essenza Ultrasonic diffusers make an elegant display and a very acceptable gift for Mother’s Day, Birthdays, Christmas gifts or just a way of saying a special ‘thank you’. Click here to view a full range of Essenza products.